Many moons ago, I had a sudden urge to change my hair style. I knew I didn’t want to chop it (although I’ve always been curious to know what it would be like to have short hair) and a new style wasn’t going to scratch this itch. A chat with my sister and a glass of wine later – before I knew it, I had blue hair. You can see the whole post on that HERE (and see more here, here, here and here). Although I LOVED it at the time, I had a heck of a time getting the stuff out. My hair is naturally light in colour and tends to hold colour quite well, so it drank up that blue hair dye and didn’t want to let go. The box said it would wash out in 2-3 washes yet 3 weeks later, I was still trying to scrub it out. So, when a company called Brite Organix offered to send me a second go at the coloured hair thing, I didn’t flinch. I opted for the pastel pink and absolutely loved it. The best part is that it’s also vegan, cruelty free and organic! Of all the products they sent me, I decided to use this one. 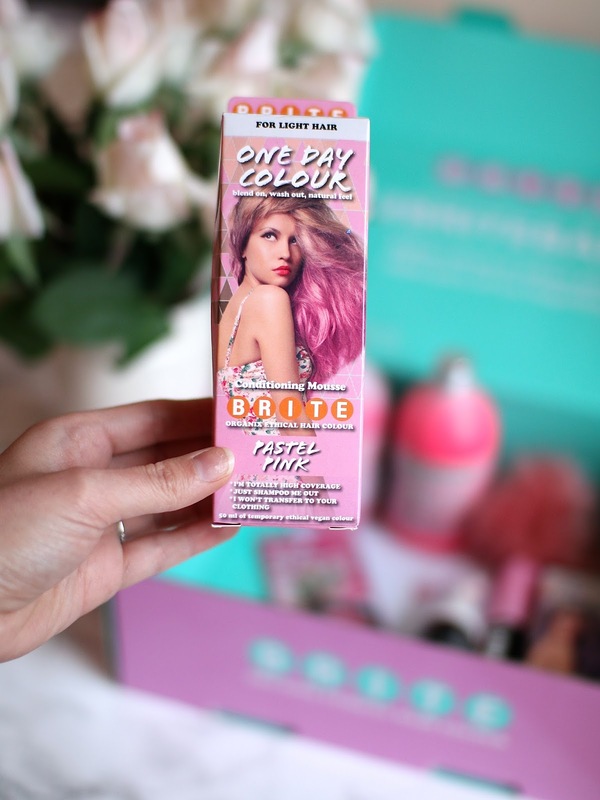 It’s a one day colour made for blondes and worked like a dream on my light hair. The product itself is a liquid but turns into a foam as you dispense it into your hands. If you’re worried about the mess, fear not! It was completely mess free, didn’t stain my hands, and once it dried – didn’t transfer at all. It’s the perfect pastel pink that I was hoping for. I kept telling Ken that I felt like a character from My Little Pony. It seriously made my day. Keep in mind it is a one day wash out, so if you live in a rainy area, it may transfer to your clothes if it gets wet. However, when dry, it did not transfer AT ALL. I even went to bed on a white pillow case and inspected it when I woke and – nothing! Washing it out was a dream. I didn’t have to scrub to get it out and it didn’t dry my hair out either. I’m tempted to try the shampoo and conditioner as well (shown above). It works by gradually adding colour to light hair and or by helping to hold colour in hair that is already pink. They also make these products in blue and purple and are available for those with dark hair as well. I’ll definitely be trying it out again. What do you think? Yay or nay on the My Little Pony hair?